Upon receiving your online order, we will ship your items within 24 hours. If your order contains Graphics, you must proceed to the next step. All of our graphic products contain graphic templates that can be found in the "Specifications" tab located just beneath the master image of each page. Utilize these templates, and pass them down to your designer to ensure your graphic files are designed in the correct layout and format pertaining that that particular product. After you have placed your order, simply upload your files by clicking on the UPLOAD FILES tab located at the top of our website. You may also upload artwork by clicking here. Please reference your order number in the "message" section when attaching and uploading your artwork to our system. Once the upload is complete, you will receive an auto-confirmation stating that the transfer has successfully been uploaded. Our graphic department will then download your artwork, and generate proofs for your approval. You will receive these proofs via email within 24 hours of artwork submission. It is then your responsibility to review the proofs, and reply back with an approval to trigger the production. *ARTWORK PROOFS MUST BE APPROVED BY 12PM PACIFIC TIME TO BE SENT INTO PRODUCTION THE FOLLOWING BUSINESS DAY* If proof approval does not meet this deadline, production will roll over to the following business day. Upon your approval of the graphic proofs, your custom graphics will go into production for the duration of the listed leadtime. On the final day of production, your products will ship from our production facility. Please make sure the delivery address you stated when you first placed the order is accurate. Should you require to rush shipping, you must let a member of our team know prior to the final day of production when your product is scheduled to ship. Estimated production and lead time can be found on every product’s page under “Product Details.” Any order that includes a printed component must receive approval on all artwork proofs before production can begin. Standard lead times follow artwork approval, based on approval time. Orders without a printed component will ship within 1 business day (contingent on current inventory and stock levels). WILL SOMEONE TAKE A LOOK AT MY ARTWORK BEFORE IT PRINTS? Absolutely. All orders that include a printed component are looked over by our design team before they are sent to print. Artwork proofs will be emailed to you for approval before we move forward with the order. Production and lead times are based on client approval on proofs, and artwork must be approved by 12pm PT in order to begin production the following business day. No Sales Tax will be charged to orders being shipped outside of Texas. Orders being shipped within Texas will pay a 8.25% sales tax. Requests for returns or exchanges must be made within 3 business days of receipt. Custom prints do not qualify for returns or exchanges. Return shipping and/or restocking fees may apply. 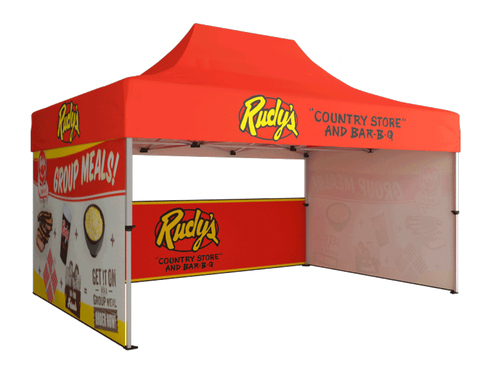 We understand that you have a lot options to choose from when it comes to sourcing your trade show displays. We also understand how many decisions are involved in planning for a trade show, exhibition, or event, and how time consuming this can be. Our purpose is to make the most important decision, choosing a trade show display, the easiest one. While cost is an important factor in making a purchase, quality and customer service are just as important, if not more. That’s why at Display Overstock, a division of Galaxy Displays, we have made it our mission to provide excellent portable display products that are easy to assemble and designed to last. All of our Galaxy Frames are backed by a Lifetime Warranty, and we have the in-house customer service to support it. Our knowledgeable sales team is excited to help you navigate through the buying process. Your job is big enough – let the pros at Display Overstock take it from here. We believe quality marketing materials should be fast and affordable for everyone. Many of our products we manufacture ourselves, allowing us to control cost of goods and keep prices as low as possible. We are always striving to keep our prices competitive and fair, which is why we offer a low price guarantee on comparable products! Send us a final quote from any competitor and we will match or beat that price. CAN THE HARD CASES BE SHIPPED OR CHECKED AS LUGGAGE? Our hard cases are specifically designed for transportation by hand to and from events. If you're planning to ship your display, we suggest reusing the cardboard shipping carton that your kit comes in. If you're planning on checking as luggage on a flight, we suggest wrapping the display in saran wrap to protect the package from damage. For more information on hard case care, CLICK HERE. HOW DOES THE FREE SHIPPING PROMO WORK? Our Free Ground Shipping promotion for orders over $1000, covers FedEx or UPS Ground shipping to all 48 states in the contiguous US. To better serve our customers, we warehouse products across the United States, allowing most orders to generally arrive anywhere in the country in 2-5 business days after the production or lead time. Note that there may be additional shipping charges for other products, and/or Rush orders.